That sandstone bluff was a sight for sore eyes. Well, sore legs, at least. We needed a proper, safe place to bivy for the night, and I was already salivating over the stunning photos I imagined myself snapping from there: the sun setting softly over the sagebrush meadow, our three sleeping bags laid out on the shoulder of the towering formation. Our legs were tired of pushing through the deep sand, carrying heavy packs, and we were ready to call it a day—so morale took a hit when we realized that the entire meadow that lay between our hot, tired feet and the afternoon shade of the bluff was covered in extremely fragile cryptobiotic soil crust. Our footprints traipsing up to the dreamy bivy site would crush that delicate crust, the vital living ground cover that supports countless parts of the desert ecosystem that we’d come to enjoy. It could take up to 50 years for the desert to restore what we would have annihilated just walking to a rock we could sleep on. 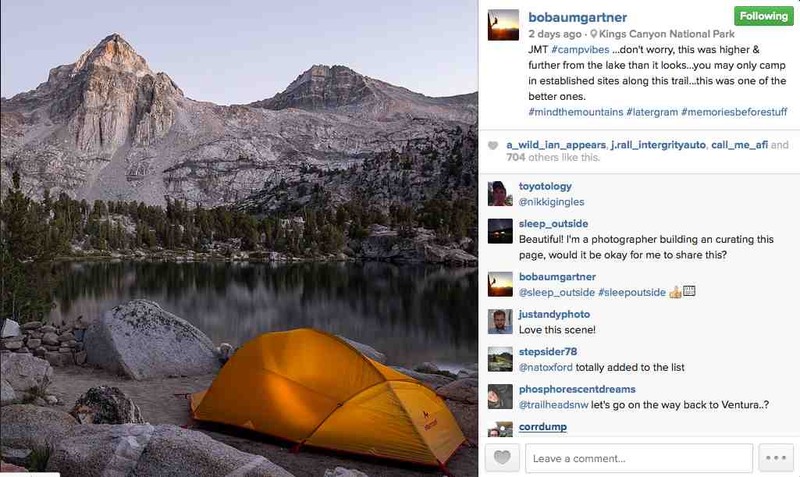 For a moment, our hopes of that Instagram-worthy camping spot were dashed. We eventually found a crust-free wash leading up to the bluff and climbed through the junipers growing out of it to avoid stepping on the fragile crust on each side. 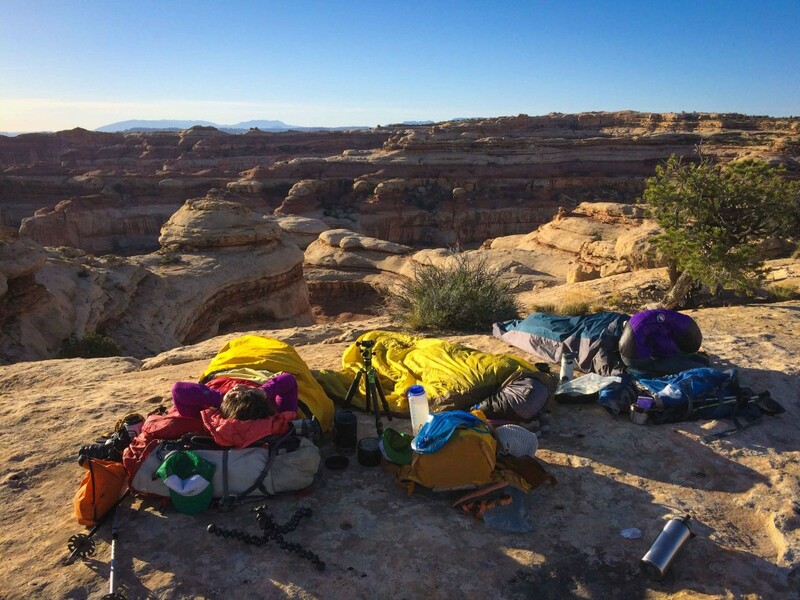 The bivy was just as incredible as I’d hoped, and we carefully walked back down through the sandy wash the next day. The striking peak and glowing tent caught my eye, but it was the caption that made me look twice: “…don’t worry, this was higher & further from the lake than it looks…you may only camp in established sites along this trail…this was one of the better ones.” Why did @bobaumgartner feel the need to point out that the tent in his spectacular shot wasn’t actually three feet from the mirror-smooth lake water? Because Leave No Trace ethics say to try to camp in established sites, usually at least 200 feet away from a lake or stream. The idea is to minimize water pollution and lower the visual impact for other people in the area who might also want to enjoy the backcountry scenery. I thought back to several other stunning photos that had floated into my feed lately, many of them with tents set up in spots I doubted the photographer actually slept. A few of them with people doing illegal or frowned-upon activities like building a fire in the backcountry of a national park or camping right alongside a lake. We all love finding that lookout point of a lifetime, or that secret tent site where it feels nobody else has been before. Out in the wilderness, we enjoy feeling free—it can be tough to want to “live by the rules.” And now that we’re all uploading our very best trip photos for audiences of dozens, hundreds, maybe even thousands of people on Instagram and other social media, we’re not just thinking about the view over there, or the most enjoyable spot to spend the night. We want The Most Epic Tent Site On Earth for our photo, whether or not it’s an already established, or Leave No Trace, site. But with more and more people venturing out to hike and camp, these delicate, untouched places will quickly be trodden and destroyed if we aren’t careful. It’s up to all of us to protect those photo-worthy spots, and I’m realizing that sometimes even a single footprint makes a difference. 18 Responses to Is Your Instagram Destroying The Environment? That’s an interesting point, Hilary. 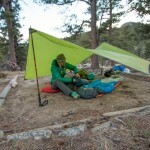 I think I’m guilty of the same thing–although I’ve always loved both photography and camping in beautiful places, I now think a little bit about Instagram when picking out a tent site. That’s so weird. I recently saw an Instagram post of a woman standing on the top of one of the walls of the “False Kiva” in Canyonlands National Park. I calmly and rationally pointed out that she was standing on a Native American ruin. She deleted the comment. A day later it was still bugging me, so I tagged @nationalparkservice on her post. She deleted the photo from her account immediately. 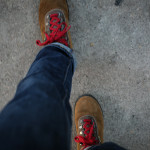 I felt like a rat, but I was thinking about the same things that you mention in this post–if it’s acceptable to post unethical outdoor behaviors for the same of the Instagram, then aren’t more people going to be encouraged to do the same? I love this article and I couldn’t agree more. I have been deeply troubled by the lack of respect for mountain environments that I’ve seen in some truly inspirational images. I recently posted an image from a very “instagram-famous” ice cave in the Canadian Rockies with a caption about safely playing in the mountains and on glaciers. It was met with plenty of great responses, but the most common was that I was the first person to ever mention the safety aspect. Everyone else just posted the epic shot, often with people in skinny jeans and running shoes despite being on the toe of the Athabasca glacier. It is an alarming trend and I fear one that is destined to grow. It won’t surprise me if we read about deaths this summer related to replicating instagram images. I think this definitely puts the spotlight on something that isn’t really mentioned..
And I think this affects how/what people think about when spending time in the outdoors; they care more about getting that awesome pic, instead of enjoying the experience & soaking it all in. Thanks for pointing this out Hilary. It’s something that’s been on my mind – not just because of the duplicative nature of IG photos – but because there are some bad habits being shared. It’s awesome that there’s more awareness about caring for our wildernesses, but it’s coming at a sort of bizarre cost. We need more people to model that the fact that we’re spending more time outdoors is good enough. We don’t have to strive to get those crazy epic “IG-worthy” shots, at whatever cost. Interesting article, thanks for sharing. I think it is up to the more experienced outdoors-people to teach and lead by example. It’s great that more and more people are getting into the outdoors- it means more voting power and public sentiment to protecting our environment and protected lands. However, we’ve got to instill a strong message and culture around our activities. Social media is a great way to continue to develop this cuture- thank you for leading by example! This article was well written! As Stewart’s of this great land we need to think carefully why we want to post something in the first place.. While it’s nice to share untamed and remote places, such posting on social media .can adversely affect their solitude and beauty. Leave footprints and take only memories. seems that these days nothing is sacred anymore. only getting the “key shot”. when is the experience enough? How about these images are kept for private enjoyment. What a shame the most pristine places are being exposed and exploited on social media. Thank you so much for this perspective and reminder. I’m guilty of posting a photo of friends cliff jumping into a watershed. It was a big eye opener when people called me out on it. It was a learning experience and I think there needs to be greater awareness about this topic. So thank you for taking the time to write this! I think the attitudes/motivations of some and the ethics behind photo ops are becoming an issue which need to be addressed very soon. There will always be idiots that do stupid things no matter what but a bit of self policing by the IG community and better education by the park services (locally and nationally) aimed specifically at these issues could go a long way. Very insightful and poignant essay. Social media apps, like Instagram, do seem to represent a powerful force in shaping human behavior–whether for good or bad. I’m sure that self-importance and narcissism are growing by leaps and bounds. Great article. REALLY great post. I am constantly conflicted with social media encouraging people to get outside. While it’s ultimately a positive thing, more people need to realize that they pose the biggest threat to the outdoors and the fragile ecosystems which it sustains. That being said, I think social media is one of the most powerful tools to aid against protecting the wild. Happy to have stumbled on this article. The same trend seems to be picking up culturally as well, it’s become very popular to post “artifact” finds on instagram (as an archaeologist this is very, very irksome.) I’ve witnessed people posting national park finds here in Texas, which is completely unethical, and illegal. People are looting for followers, and it’s a very frustrating and often futile thing to try to prevent. 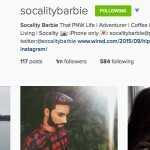 Along the lines of this (and your most recent instagram related post!) 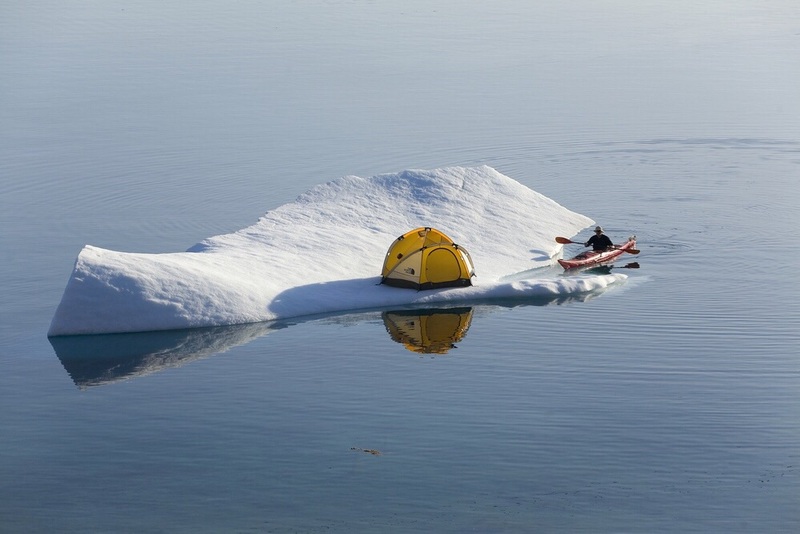 there is a new instagram account/hashtag for #youdidntsleepthere ….. a collection of photos of tents in amazing, and sometimes ridic places. Maybe they did sleep there, maybe it was just an amazing setting to look super cool and get lots of likes and make oneself appear like the ultimate outdoor adventurer with the coolest life ever. What I get out of accounts like this (and @SocalityBarbie) is many of the same things, like being different is just more of being the same, and I’m sure that there are a huge amount of people that are authentic, and probably a lot more that have been drawn into the trendyness of it. I think its a good time to try to think about why you want something, and a deeper connection may be a part of it. But when you want that wool blanket because it is just like one you remember at your grandparents, go looking for your grandparents, don’t buy one that’s now made in China. Great post. I also felt this a number of times when seeing the instagram photos. need to sporead awareness about this to masses. Very moving article. Lots of commenters agree that something needs to be done. Let’s do something! This is the age of crowd sourcing and viral trends. Change starts with those who believe in it. I propose that those people who choose to be so bold, comment on those photos with #pleaseLNT, to remind Instagrammers that natural places are beautiful because they are natural, and respect for them will keep them that way. Maybe it will catch on! Maybe this hashtag will reach thousands. If it does, maybe it will get Instagram’s attention and we can ask for application features that discourage compromising nature to achieve a popular pic. After all, a popular image and social media platform [https://www.instagram.com/kevin/] shows that the CEO is quite the nature lover.